What's this you see?! An actual hair tutorial on my blog?! Don't worry I nearly fell off my chair too. As i've been slacking on hair tutorials, i decided to do two do's. Really easy ones at that! All you'll need is a hair elastic and a few pins and these hair-dos will take you 3 minutes to do at the max. 1. Tie your hair up in a low pony-tail, on the last tie pull your hair only half way through the elastic and leave it. I used Scunci clear hair elastics. 2. The hair that is left out of the bun can now be wrapped around the hair elastic, make sure the hair is flat to your head and hold it in place. 3. Grab as many bobby pins as you fancy and secure the wrapped around hair in place. The trick to hiding the pins - push through the hair horizontally and then straight down vertically. 4. Pin back any loose ends and use hair spray for fly aways and dead ends (as you can see i have about 1000). Once you've given it a spritz, you're good to go. 1. Tie your hair up into a ponytail, low or high its up to you! Now loop your ponytail around your fingers. 2. Once you have created a loop using your ponytail, pull the end of your hair through it, exactly how you would when creating a knot. 3. 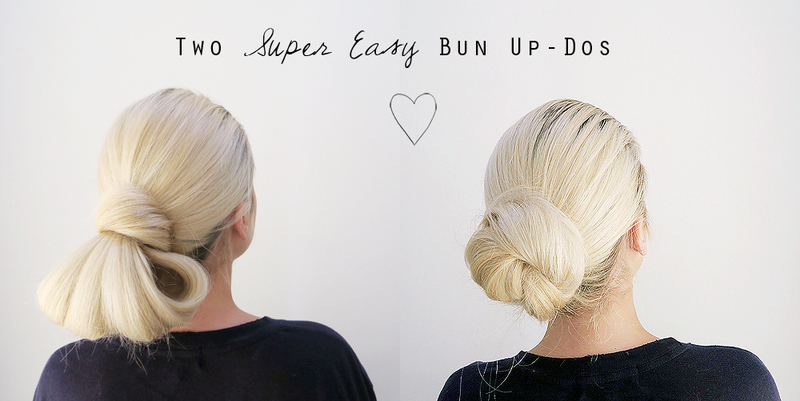 Pin the bun to your head with as many bobby-pins as you need. Leaving the tail end out for the moment. 4. Now pull down the tip of your hair and wrap it around the lower half of the bun, pin it in place and you will have yourself a snazzy knot bun. And that's it! Do let me know if you try any of these and as always send me pictures of your do's. Such a cute hairstyle! How do you do your GIF's?